Apparently a suspicious parcel had been found in the terminal. That resulted in an evacuation of the building and the surrounding area. A bomb squad moved in and took care of the parcel, which was found to contain a small TV set. (This information is unconfirmed, but was given by an airline employee.) Suspicious parcel-scare over, business returned to normal and the whole incident didn’t last too long anyway. 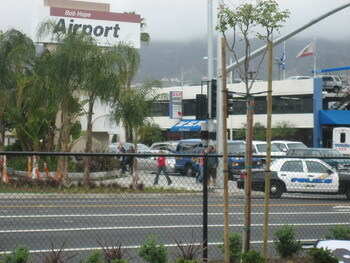 The interesting fact however was this: The day before an anime convention had begun at a hotel near the airport. So amongst the many passengers milling around outside the airport waiting for some kind of information about their flights were quite a few convention goers who for some reason or other had to leave earlier. They were easy to spot, they wore full anime regalia. Which leads to the question: What rattles a check-in employee more – a bomb scare or Mituki Shinomiya and Itachi Uchiha turning up at the counter? Well, thank goodness it wasn’t a Star Trek convention. That might have been even scarier. The really, really scary part were the bad costumes. I have seen people at anime conventions with impeccable outfits, accurate down to the last detail, flawlessly executed. The costumes I saw that day were just bad, sloppy and ill-fitting. Maybe it was not a really important convention. Or those people going home earlier had been shown the door, because they lowered the standard.